No real need to drag out the mixer - an ordinary mixing bowl and wooden spoon are all you need. Preheat the oven to 350º, and generously butter an 8 x 8" pan or flat baking dish. In a medium bowl, combine the melted butter and brown sugar. One at a time, beat in the eggs, and then the extracts. In a smaller bowl, combine the flour, salt and baking powder. Mix the dry ingredients into the butter mixture. 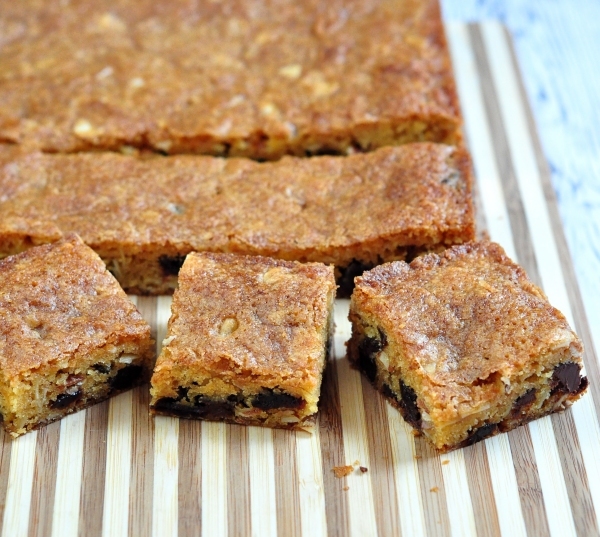 Mix in the cherries, chocolate chips and almonds. Bake for about 28 minutes - a toothpick inserted near the center should come out clean. Cool in the pan, then cut into squares or rectangles to serve. Store leftovers tightly wrapped at room temperature for up to 5 days.